As long-time readers of this blog might know, I direct Washington Square Park Eco Projects. 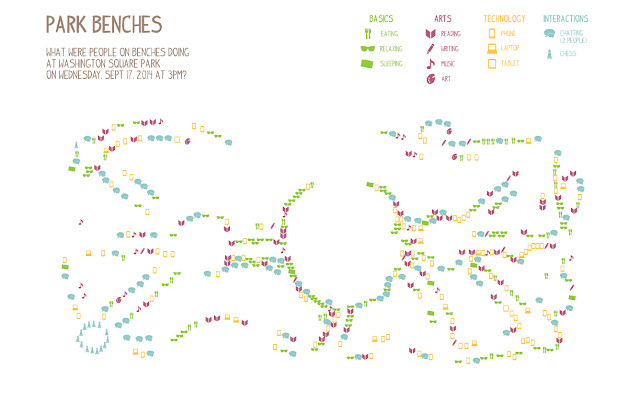 As part of my social media work for the organization, I often post a map of the park to Instagram on Mondays. 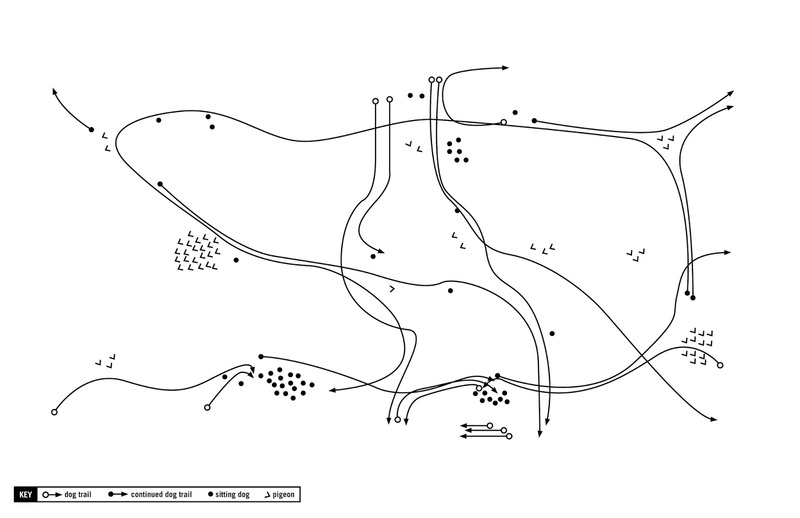 About a month ago while researching maps of the park, I came across the work of students in Public Interfaces, a course taught by Michael Luck Schneider at the School of Visual Arts. 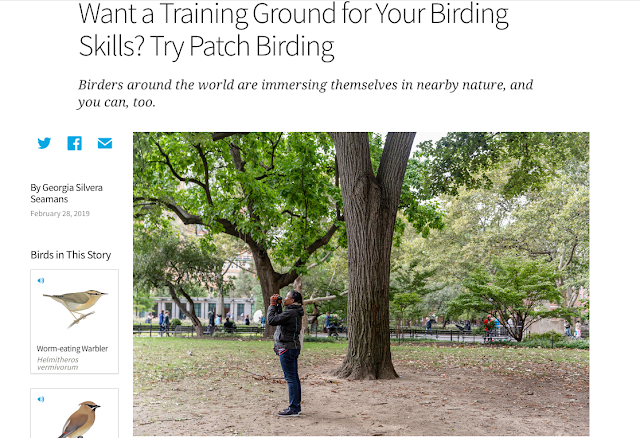 I reached out to Michael who in turn reached out to his students who granted permission to feature their work on this blog. Behavioral mapping is a type of systematic observation research that tracks behavior over space and time. The tracking may focus on a particular place or be based on an individual's movements. We term these two techniques place-centered and person or individual-centered mapping. You may be familiar with The Social Life of Small Urban Spaces by William H. Whyte. Using behavior mapping techniques, William Whyte observed and analyzed how people used small spaces in New York City. Jane Jacobs in The Death and Life of Great American Cities and Jan Gehl in Life Between Buildings also relied on behavior mapping to develop their theses. The fountain and the eastern quadrant of the park seem to be more activated than the western quadrant of the park. Certainly the "street artists" seem to be concentrated at the fountain and to its east presumably catering to foot traffic. 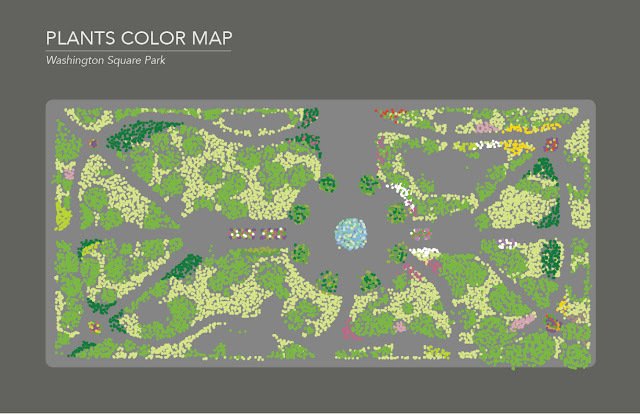 The Plant Color Map clearly shows the rectilinear nature of the park even though it is named Washington Square. Also, the Plant Color Map highlights that the fountain is not in the center of the park. Another observation from this map is that the western quadrant of the park has fewer areas of herbaceous perennials (and annuals) as indicated by the non-green colors on the map. (Note: the maps were developed using data collected in September 2014.) 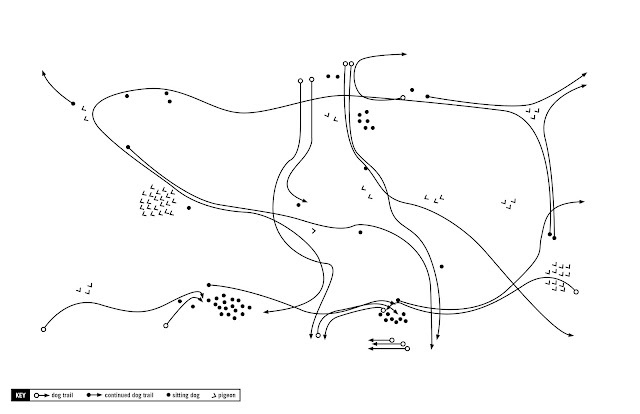 In the fourth map of dog trails and pigeons, the two dog runs show up clearly along the southern edge of the park. 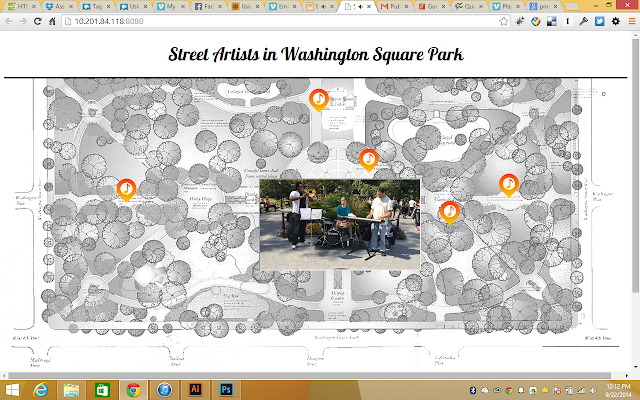 The large cluster of pigeon in the western quadrant is recognizable as the preferred location of Paul ("The Birdman" of Washington Square Park). What else do you notice in the maps? Thank you to Professor Michael Luck Schneider and his former students Amy Wu, Melody Quintana, and Sunnie Ni. 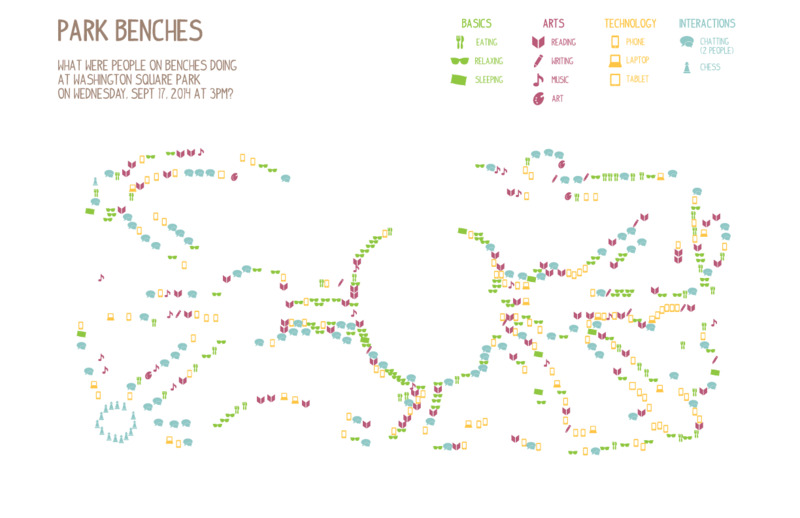 It is wonderful to visualize in different ways the variety of ways in which the park is used. The Plant Color Map is also a nice complement to the WSP Eco Map! Disclosure: The links to book titles in this post are Amazon affiliate links. Money generated through your purchase is used to support this blog.